Preserving an American Musical Heritage…..one note at a time. That's what the new San Clemente Chapter of the Barbershop Harmony Society is all about. They do it every Monday evening at the Clemente Presbyterian Church at 119 N. Avenida De La Estrella, San Clemente. Anywhere from 20 to 40 men gather every Monday at 7 pm to learn how to 'ring chords' and make great four-part harmony. The songs are generally familiar to those attending, like: California Here I Come and other songs like the popular song of the 60's, Hello Mary Lou, once sung by Ricky Nelson. The Chapter, part of the international Barbershop Harmony Society, is seeking new members and is rapidly becoming a part of the vibrant San Clemente arts scene. Guest and 'listening'loos' are welcome to drop in. The Chapter has aggressive expansion and performance plans in the south county area including communities from Lake Forest to San Clemente. A fun time is promised to all attending singers. 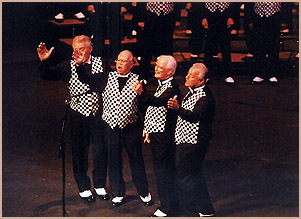 Groups, organizations, individuals and civic events are invited to consider a Barbershop Quarted for their next function. ©Copyright 2005, All Rights Reserved Worldwide. Site design by Purpose Media.